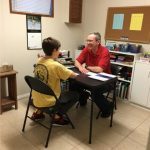 Does your child need more than traditional tutoring? Standard tutoring attempts to re-teach academic areas that were not successfully learned. This doesn’t work for students with weak learning skills. It becomes more and more of the same thing that isn’t working and results in frustration for everyone. Think Smart Center specializes in helping struggling students from primary through college achieve their potential within MONTHS rather than years. Think Smart Reading Program is an accelerated, “phonemic awareness” reading program that focuses on the crucial need to understand and hear reliably the sounds of a language before learning to read. This enables beginning readers and even non-readers to progress at an accelerated rate of learning. Does your 1st or 2nd grader struggle to read? As parents, we expect our children to take a major step in developing their reading skills during this critical year. When this development falls short of these expectations, many parents are left wondering why and how they can help their child to succeed. When a child struggles to develop in reading, there is usually an underlying cause. Because of this underlying problem, the child does not learn to read well or read at all regardless of how hard they try. Whether your child is in first or second grade, their reading foundation can be corrected in a few months by improving the underlying skills necessary for reading and for learning.